Anne Goes to Back to College! 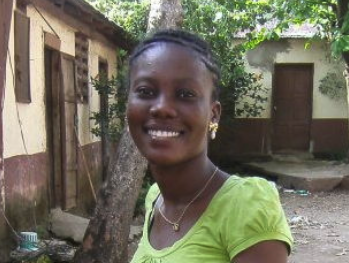 It’s back-to-school time in the United States, and so too for our dear friend Anne in Haiti. Anne’s first year of studies in Port au Prince was not without its challenges – including homesickness, city prices, and French, the language of *all* of her coursework. But she faced these things head-on, always with her honest, cheerful grace. In fact, Anne reports she studied French every day after her regular coursework, and the language became one of her best subjects!! Anne is ready for the next step on her path to becoming an accountant, and we’re determined to see her get there. As with her first year, we expect Anne’s sophomore year costs to total around $3,000. So we'll need your help to meet this goal! We love Anne and want to see her thrive. Know that whatever amount you can give will be going to a wonderful cause, and will be deeply appreciated. ABOUT Anne Lormeus goes to College! For those of you who’ve been on a trip with us, you’ve likely been impacted by the loving smile and warm personality of Anne Lormeus. An EBAC graduate, Anne has translated for our teams, assisted on medical trips, and been part of several Haitian choir albums. In 2016, Anne embarked on a new journey, pursuing an accounting degree in Port au Prince. At Espwa, we know that education followed by meaningful employment is a proven path to overcome poverty. Anne is on the right track and we fully support this endeavor! Go get 'em Anne! Joseph Shaffer 09/17/2017 $150.00 Yay Annie! Cory St. Esprit 09/14/2017 $100.00 Best of luck in your studies Anne!! Kristin Rumcik 09/04/2017 $225.00 Good Luck with your studies! Gary Molinaro 09/01/2017 $100.00 Study hard! !